I am registered to ride the Momentum 94.7 cycle challenge in a few weeks. Using it as a motivation to get fit before my next trip from Johannesburg to East London South Africa.The Momentum 94.7 cycle challenge is a very popular race in Johannesburg. It draws the serious riders and those just out for a day’s outing. This is one way to see Johannesburg and get the right of way at the traffic lights. Planning on riding with my mountain bike. So do not expecting a very good time. Time should be better than the Cape Argus earlier this year. See they have renamed it for this coming year, it is now Cape Town Cycle Tour. If any body wants to link up with me to chat about my cycling adventures. I am riding in group K and my number is 9743. Will probably ride with my pannier rake on without panniers. My bike is a titan. Most likely will be riding in different kit to what I am in on the photo. Other wise drop me a tweet on @kennyfagan. 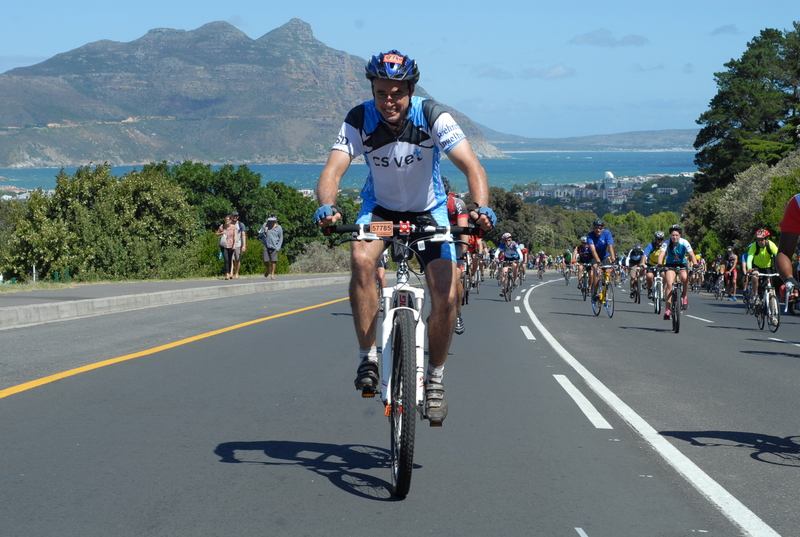 This entry was posted in Bicycle riding and tagged Cape Town Cycle Tour, Johannesburg to East London, Momentum 94.7 cycle challenge, Titan by krfarmer. Bookmark the permalink.